Have you decided on a 1440p 144Hz gaming monitor but you’re not sure which one to pick? Well, the MSI Optix MPG27CQ is certainly a model you should consider. It’s a 27″ curved monitor with AMD FreeSync, 1ms MPRT, and a VA panel with high contrast and wide color gamut. And if you like RGB lighting, you’re in for a treat. 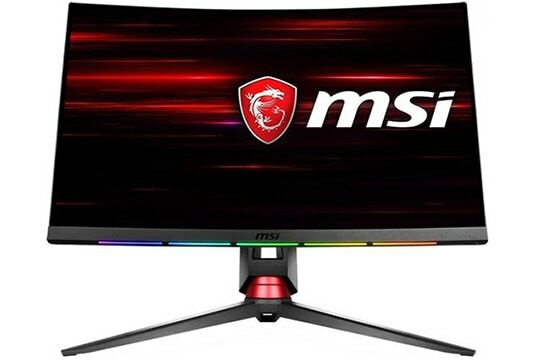 The MSI MPG27CQ monitor features the WQHD resolution with 2560×1440 pixels which on its 27″ display provides a rich pixel density of 108.79 PPI – Pixels Per Inch. With such a high pixel count, you can enjoy plenty of screen space as well as maximum detail without any scaling necessary; shortly, it’s the perfect screen space/detail clarity ratio. Moving on, the monitor is based on a VA panel with true 8-bit color depth and covers 115% of the sRGB color gamut. In addition to its superior contrast ratio of 3,000:1, a decent 400-nit peak brightness, and the 1440p resolution, you get an immersive picture quality with rich colors, deep blacks, and vivid details. Although the monitor specifies 178-degree viewing angles, they aren’t as good as the 178-degree viewing angles of IPS panel displays. So, some minor shift in contrast is expected if you’re looking at the screen from the sides, though it only becomes bothersome at extreme angles. Overall, the display runs perfectly smooth. We didn’t find any dead pixels nor prominent backlight bleeding; the screen is also flicker-free and has an integrated low blue light filter. The MSI Optix MPG27CQ input lag is only 9ms which will ensure that there’s no noticeable delay (even by professional gamers) between your keyboard/mouse actions and the display’s reaction to them on the screen. Ghosting and motion blur is usually associated with VA panels, but the MSI Optix MPG27CQ can handle it quite well via its 1ms MPRT (Moving Picture Response Time) technology. Once you turn on the ‘Anti Motion Blur’ feature, the monitor enables backlight strobing which reduces ghosting and trailing of fast-moving objects. Keep in mind, however, that when this feature is enabled, you can’t adjust screen brightness nor use AMD FreeSync – into which we’ll get later. So, unless you are playing fast-paced games, leave this feature turned off. To access the OSD (On-Screen Display), you can use the joystick placed at the rear of the monitor. Alternatively, you can use MSI’s desktop application or even an Andriod application on your smartphone called ‘MSI Remote Display App’. The OSD menu is very user-friendly and straightforward with numerous features available. While not in the menu, you can flick the joystick upwards to enter the Game Mode presets which include Racing, FPS, RTS, RPG, and User [Default]. Pressing it downwards opens up ‘Screen Assistance’ which consists of customizable crosshair overlays. If you press the joystick to the left, you can set an alarm clock while pressing it to the right allows you to change the input source. 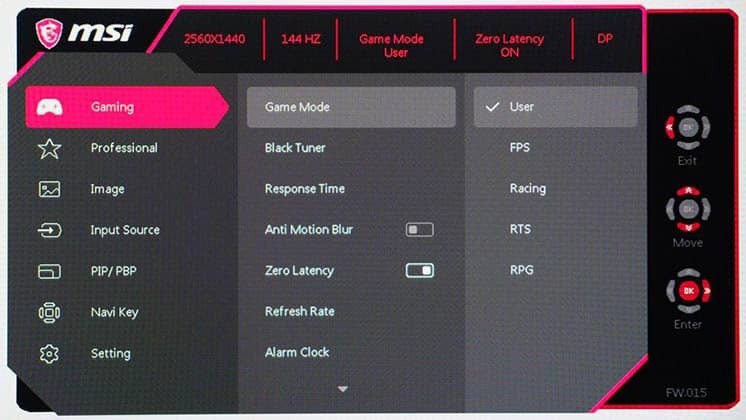 Other gaming features include ‘Black Tuner’ for better visibility in darker games, ‘Zero Latency’ for lower input lag, and ‘Refresh Rate’ which allow you to place an on-screen FPS (Frames Per Second) counter. You will also find ‘Response Time’ setting with Normal, Fast, and Fastest options. The ‘Fastest’ mode actually enables Anti Motion Blur. Setting it to ‘Fast’ barely increases the response time speed as ghosting is clearly visible. For the best results in fast-paced games, you will need to use Anti Motion Blur. The MSI Optix MPG27CQ curved gaming monitor supports AMD FreeSync variable refresh rate for those with compatible graphics cards. 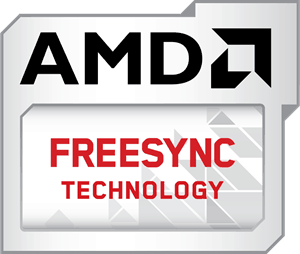 FreeSync synchronizes the monitor’s refresh rate with the GPU’s frame rate and consequently, removes all screen tearing and stuttering within the dynamic refresh rate range. The MSI Optix MPG27CQ FreeSync range is 48-144Hz/FPS meaning that it also supports LFC (Low Framerate Compensation), so if you have a compatible AMD card, smooth gameplay performance is guaranteed. Unlike most monitors with RGB lighting, SteelSeries’ GameSense RGB lighting of the MSI Optix MPG27CQ enhances your gameplay experience with more than just glowing colors. In compatible games, it allows you to assign the five RGB panels at the bottom bezel to depict your HP, ammo, cooldowns, killing blows, and similar values. If your favorite games don’t support the SteelSeries Engine, you will still able to synchronize the RGB LEDs to the rest of your MSI compatible gear and to customize the lighting at the front and at the back of the monitor. Unfortunately, there aren’t many games that support it, but this will hopefully change in time. Supported popular games include CS: GO and DotA 2. The MSI Optix MPG27CQ 144Hz gaming monitor has a 1800R curvature which isn’t particularly noticeable on a 27″ screen, but it does add to the gameplay immersion. Moving on, the monitor has a versatile design with up to 120mm height adjustment, -5°/20° tilt, -/+ 45° swivel, and 100 x 100mm VESA mount pattern, but there’s no pivot function. Connectivity includes DisplayPort 1.2a, two HDMI 2.0 ports, a dual USB3.0 hub, audio line-out and microphone line-in ports, and a combined audio jack. 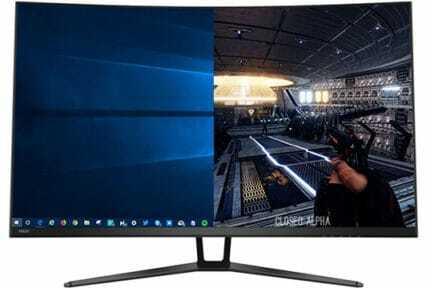 For 2560×1440 at 144Hz and FreeSync, you can use all three display connectors. 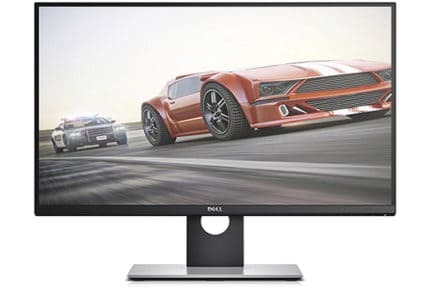 The monitor also has an anti-glare coating and ultra-thin bezels, ideal for multi-monitor gaming setups. The MSI Optix MPG27CQ price is ~$450 which is understandable given its exclusive features. 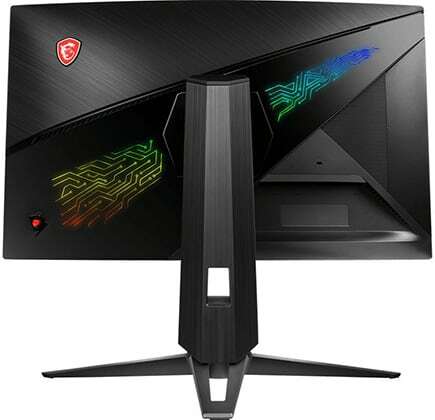 However, for the same price, you can also get excellent 27″ 1440p 144Hz IPS gaming monitors such as the Nixeus EDG27S v2 and the ASUS XV272U. If you want a cheaper 27″ 1440p 144Hz gaming monitor, we suggest the Viotek GN27DB. On Amazon, you will also find the MSI Optix MAG27C which is the Full HD model of this monitor. Moreover, you can find the AOC Optix MAG27CQ (1440p) as well as the MSI Optix MAG27C and Optix MAG27C2 (1080p) as alternatives without the RGB lighting. Finally, you may want to check out our MSI Optix MAG241C review. It’s the same monitor, but 24″ in size and without the RGB technology. 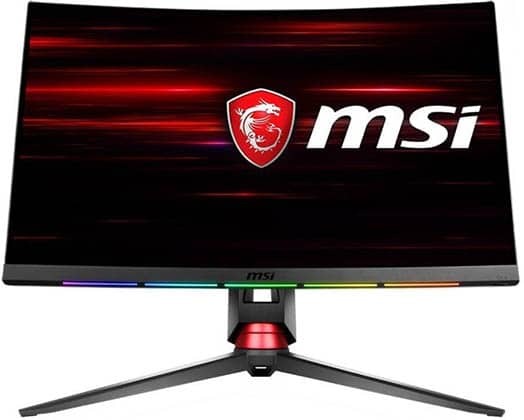 The MSI Optix MPG27CQ is definitely one of the more interesting 27″ 1440p 144Hz gaming models; either you’re going to absolutely love it or you won’t be interested in it at all. Image quality and performance are superb. Thanks to its wide color gamut, high contrast, and a curved screen, the monitor provides an immersive and enjoyable viewing experience. Moreover, the MSI MPG27CQ handles motion blur well for a VA panel, it has extensive connectivity options, a gorgeous design, and plenty of cool exclusive features. The MSI Optix MPG27CQ is one of the most interesting 27" 1440p 144Hz gaming monitors out there. It's got plenty of exclusive features including innovative RGB lighting, AMD FreeSync, and 1ms MPRT. Moreover, it's got a versatile design and extensive connectivity.